EB Industries was founded in 1965 by George DeLalio, an aeronautical engineer from Purdue University, with a vision that high quality technology and exacting customer service should be an everyday occurrence. 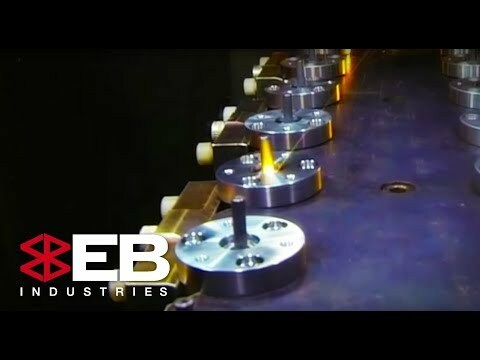 With a single Electron Beam Welding Machine, EB Industries operated around the clock in a 5,000 square-foot facility servicing customers in the aerospace, defense and electronics industries. During this time EB Industries was a part of many leading edge manufacturing companies that supported the Apollo missions, engaged in relay manufacturing and production of military aircraft components. As EB Industries grew, four electron beam welders and a dedicated team moved to a 16,000 square-foot facility, custom designed and built to support our business. With a fully equipped welding job shop, administrative offices, cleaning and testing areas and quality and metallographic labs, we were set up for the future. In 1984, as the medical device and microelectronics fields demanded high-quality work at high production prices, we added laser welding to complement our electron beam welding business. Today, our laser welding services are supported by an array of different lasers covering a power range from 50 to 4,000 watts. Our lasers also offer a wide range of spot sizes and operating modes including both pulsed and continuous wave. In 1993, Steven DeLalio, son of the founder, took over as President of EB Industries. With over 15 years of hands-on welding experience as well as an extensive background in electronics, computers and automation, the highly skilled EBI team is well equipped to be led to face the challenges of the 21st century. In 1994, we added laser hermetic sealing services, which allowed us to further serve the microelectronics, fiber optic, and implantable device industries. We take care to select the right sealing materials and proper weld configuration, parameters that are extremely important in hermetic sealing. We assure quality hermetic seals that are more reliable than mechanical seals. In 2000, EBI undertook a major process improvement and reengineering program to improve efficiency without compromising quality and service. By adopting a lean manufacturing methodology, EBI was able to greatly improve the speed at which we process customer jobs. This includes faster quoting and welding, as well as pre and post part processing. The program also greatly enhanced our quality management system which is the backbone of our NADCAP, AS9100 and ISO certifications. In 2013, EBI launched a strategic investment initiative aimed to expand our capabilities to better serve the needs of our customers. This program includes adding additional equipment and capabilities, growing our workforce, and expanding the size of our shop floor. We see continued growth in all of the industries we serve and look forward to sharing with our customers a bright and prosperous future. Our greatest asset is our people and our culture. Our team has a diverse set of skills from a wide array of different manufacturing areas and industries. We have a passion for the quality of your parts and a desire to solve your toughest joining challenges.